The life of an art museum goes far beyond what meets the eye. An intricate system of checks and balances are always at play without one even registering anything else is happening besides observing the art being displayed. 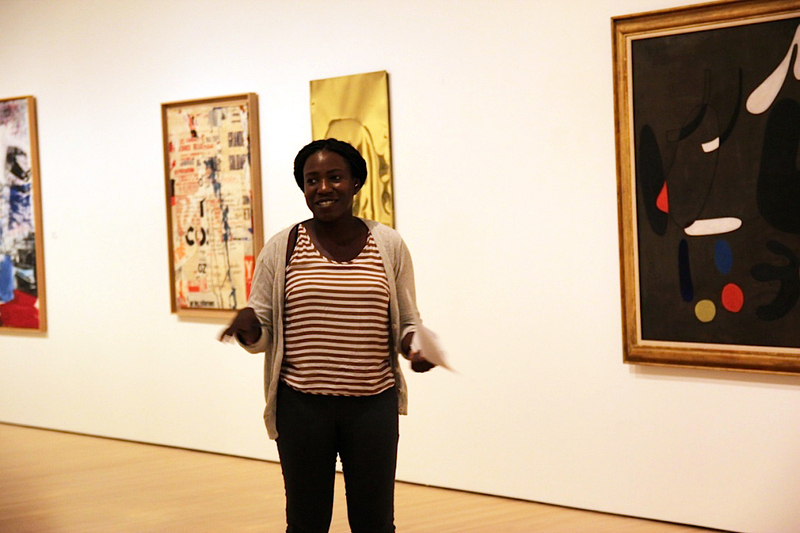 The Internship to Promote and Encourage Diversity in the Museum Profession at the Kemper Art Museum has provided me with an inside look into how a museum functions, which is incredibly valuable for someone who does not have a formal art background. I recently graduated with a dual master’s in architecture and social work from Washington University in St. Louis. I have been interested in art museums for a long time and their place as cultural institutions in society. I love art museum spaces and the experience of retreating to a visual euphoria. Or engaging an object that challenges your perspective about the world. After visiting the Venice Architecture Biennale last summer, where Rem Koolhaas curated a phenomenal exhibition entitled Elements of Architecture, my interest was really piqued in curating. I was excited to see a rigorous approach to investigating fundamental building components while engaging in commentary about the shortcomings of today’s architecture practice, all presented in a cohesive visual presentation. With this experience I became increasingly motivated to incorporate curating methodologies into my own practice and wanted to learn more about museum professions in general. Throughout the internship I gained exposure to multiple elements of the museum, from security protocol to educational programs offered in the museum. One-on-one time with each department (education, curatorial, registrars, art on campus, marketing, and publications) at the Kemper made the experience comprehensive and highlighted roles and aspects of museums that most people are not able to witness. I also engaged in a number of small projects that allowed me to have hands-on experience with each department, such as creating a report on social media and how other peer institutions use different platforms such as Facebook and Twitter as a way to reach the community. I was able to research and make contact with several other peer institutions throughout this project, which expanded my knowledge of other university museums. While having a broad reach, the internship also embraced my interests in curating, and I was challenged with relevant literature and critical discussions about social issues explored in the art world and the role of the curator. I attended an informational curatorial roundtable at the Contemporary Art Museum St. Louis (CAM) with curators from the Kemper, CAM and The Luminary, which gave a sense of diversity in methodology in the curatoial field. I even had the opportunity to directly relate my background in social work when I met with professors Vanessa Fabbre and Anna Shabsin from the Brown School of Social Work, who are organizing an exhibition for the museum’s upcoming fall teaching gallery entitled Relationships and Representation: Perspectives on Social Justice Work. We discussed how pedagogy, critical theory about social justice, and art can be examined together to inspire a dialogue about current reflections of a society. Vanessa and I have continued a dialogue about her side project, To Survive on This Shore, which is a collection of portraits and essays about older transgender people. The project incorporated a studio practice paired with more formal modes of research to give a voice to a marginalized group. I found this work to be extremely important as this is how I would like to approach my own practice. I am moving to New York City in just a few days, a city I have only briefly visited once before. Despite my unfamiliarity with the city, I am excited to be moving to one of the premier art capitals of the world. The city seems to provide endless possibilities to become involved with different aspects of the art museum culture. I believe this internship has given me a solid foundation for pursuing a career path that will incorporate what I have learned at the Kemper. I am grateful to the staff of the Kemper for being open and willing to share their work with me. I will hold this experience with me dearly as I move to the next stage.